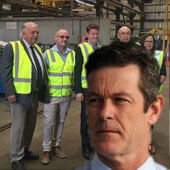 Member for Morwell Russell Northe says it is incumbent upon the State Government to take decisive action and address the Steelvision Morwell debacle that has impacted many local businesses, workers and families. "Steelvision were brought to the Latrobe Valley by the State Government with much fanfare in 2018, and the company subsequently received substantial funding to set up its operations in Morwell" said Mr Northe. "Yet less than 12 months later, Steelvision has shut the doors on its Morwell business and leaving a legacy of hurt for many" Mr Northe said. Facilitate a meeting with all stakeholders, suppliers and impacted parties so that these impacted businesses and persons are provided with all information relating to the Steelvision issue. That the State Government undertake an inquiry or investigation into how Steelvision was able to secure State Government funding when it appeared the company’s financial situation was unstable, and to which ultimately culminated in the closure of Steelvision’s Morwell business only a matter of months after receipt of Government funding. "The reality is that Steelvision would not have opened its doors in Morwell if it wasn’t for the State Government providing hundreds of thousands of dollars to the company" said Mr Northe. "The State Government simply can’t wipe its hands of this mess, and it must bear responsibility and provide leadership in fixing the problem it has helped to create!" Mr Northe said. The three measures above are reasonable, fair and achievable and I call upon the State Government to do the right thing and support Latrobe Valley businesses and workers who through no fault of their own have been left high and dry by this awful situation.